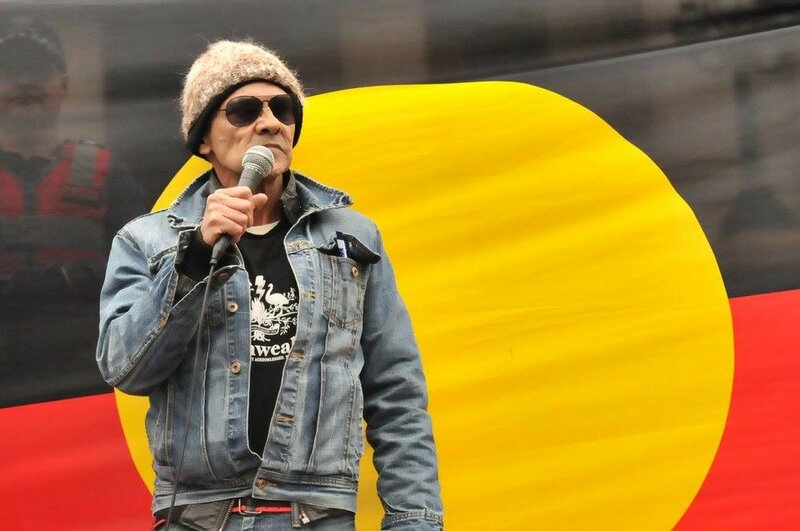 Treaty Republic is directed by Aboriginal activist Robbie Thorpe. Treaty Republic is committed to issues relating to Australian history, Indigenous sovereignty, lack of treaty, land-rights justice, genocide, national denial and 'Pay the Rent'. Australia’s oldest Aboriginal-controlled website. Online since 1993. Activist and historian Dr Gary Foley’s website includes sections including a Student Resource Index for students of history, politics, cultural studies, Australian Studies, Cinema Studies, Social Sciences and the Law. Image: The Sovereign Union flag depicts the Law of the Land and the Peoples, and also the Union meeting structure. The Sovereign Union of First Nations and Peoples in 'Australia' is asserting genuine pre-existing and continuing sovereignty over First Nations' territories, lands waters and natural resources. This is a liberation struggle educating, communicating, advocating and promoting the capacity-building of First Nation clans and Nations towards independence and governance, and involving reparation. Convened by Ghillar, Michael Anderson. This is the official website of the Sovereign Union of First Nations and Peoples in Australia. The Sovereign Union was first formed at a meeting on 12-14 June 1999 on Mt Kaputar, near Narrabri, NSW. A delegation was sent to Geneva to the UN Working Group of the Commission on Human Rights to take our sovereign voices to the international community. AIR was founded in 2015 at an international Summit, held on Tsawout traditional territory, Vancouver Island, B.C. Indigenous and non-indigenous participants with diverse cultural backgrounds travelled from various countries and regions to spend time on the land, share stories and learn from each other. The land-based learning activities and the panel between Elders and youth on resilience proved really powerful in inspiring AIR’s ongoing work. AIR’s campaign managers and dedicated volunteers are taking a grassroots approach to help foster more resilient relationships within and between communities. Through effective community engagement (in all hub locations) and crowdfunding, the alliance is working hard to generate the funding and resources necessary to bring these 7 intergenerational resilience hubs to life! Like all good things, @IndigenousX was born out of a great idea. Back in early 2012, the national dialogue was characterised by a consistent lack of awareness, understanding and respect for Indigenous people. Our vision was to create a platform for Indigenous people to share their knowledge, opinions and experiences with a wide audience of interested tweeps. The @IndigenousX twitter account was launched on the 15th of March 2012. Since then it has risen to more than 41,000 followers, and over 300 Indigenous hosts on the account have shared thousands of stories, facts, reports, pictures, and laughs with an ever increasing audience. We pride ourselves on an ethic of respect for Indigenous knowledge, successfully providing an autonomous media service. Most importantly, it has provided an online meeting place for thousands of people nationally and internationally, to share the adventures of a new Indigenous host each and every week. Decolonizing solidarity: Dilemmas and Directions for Supporters of Indigenous Struggles. Decolonizing solidarity is a book and a website full of resources and ideas. It aims to inspire, support, trouble and give direction to the work of people who support Aboriginal struggles. If you are relatively experienced, or have a specific skill to offer, then you can sign up to the database and it may be possible to direct you to an Aboriginal-led project you can support. You can also sign up to find out about new resources, ideas and actions. As depicted in this documentary, WAR is a collective of young Aboriginal people committed to the cause of decolonization and the philosophy of Aboriginal nationalism - resistance and revival. They are responsible or some of the largest and most powerful protest actions for decades.